This one was labeled as Alcantarea Odorata and I took note. I bought one last year but it wasn’t signed then and I’ve wondered what I had. Canna (many others which I didn’t photograph, I was partial to this one). In short many many fabulous things. I was tempted by Echium Mr. Happy, but passed. Several of my agaves have come from Rare Plant Research, but it’s been years since I’ve bought one here. I found myself trying to convince other shoppers that this was a plant worth having. None of them took me up on it. An acacia mash-up (the fine leaves). And consider trying another Furcraea every year (I’ve killed a couple, I resisted…again). This one I almost bought, and wish I would have. His purchases (below) were on the less prickly and more colorful side of things. After looking over the goods for sale we wandered up to the owner’s home on the hill, Villa Catalana. It’s been fun to watch it progress over the last 8 years. This year there was a bit of vehicular eye candy parked out front. All of us “zone-pushing” gardeners in the Portland area have losses from the winter cold. This poor Pineapple Guava lost a lot of foliage. And this cordyline (maybe? on the right), looks like it might have been wrapped for protection what with that damage to the leaves. Or maybe they're bent from the ice storm? Did anyone notice the long, hard, protuberance on the ground level? Alison noticed and pointed it out, with a giggle. Those of you that know Alison won’t be surprised (and that’s why we love her). I'm not much for mixed planters but this one really had my attention. And they've finished the covered atrium between wings of the home. There was a wine tasting going on inside (as if running a nursery wasn't enough work now the owners have started a winery) but the line was too long and I did not partake. It was fun to look around...and the haze you see was a cooling mist being circulated through the air. And the view from across the pond. So what did I buy? The photo below shows the assortment that was in my cardboard flat for the longest time, do you think I was stuck on dark foliage? Canna 'Australia', a pair of Ricinus communis (Castor Bean), and an Aeonium 'Silk'. I was the lucky recipient of a trio of seed grown Castor Bean from Alison at the spring bloggers plant swap but decided you can't have too many big leaf poisonous plants in your garden, right? Besides I have terrible luck with these plants (getting them to grow big) so why not hedge my bets? That was a fun day! I really need to go back and shop some more. Those cacti are pretty cool, but not hardy, right? I do like that one with the orange top. And all those plants with the swollen caudexes, I'm tempted just because they're unusual. The orange topped cactus I was smitten with was only hardy to Zone 10, so it would have been a container specimen. Did you sign up online for the mailing list? In case he has another open in June? WOW! Every year I anticipate this post! What an incredible nursery and home. That garden is fantabulous. I would have been tempted by all those beautiful bromeliads. In fact, why not have annual bromeliads!? They are easy to winter back up in the house and look ultra tropical. I think I have seen images of that tree before but thank you (!!!) for the reminder, especially as I am going to be planting today. Where to put something that can get that large? Thanks for the tour, Danger. I missed out but this time but with photos like that I think I need to put it on next years' calendar! You do, yes you do. The open house is usually the weekend after Mother's Day. I'm so bummed I missed the sale this year. We're supposed to have record heat this summer, so your castor beans should be nice and happy! That's what I was thinking, yay! Did you get one from Alison at the swap? What a wonderful visit! I'd purchased RPR plants at nurseries in my area and loved your annual posts but it didn't prepare me for how great this place was in person. WOW! It looks like you saw some things that I missed in the greenhouses. Looking forward to next year! A terrific post and a special memory! Nah, no way you missed things in the greenhouses, I saw the careful scouring you were giving them. Can't wait to see your post. I'm all for plant traditions as well, and that one doesn't look like too much of a hardship. Nice haul! That looks like one great sale and the grounds are interesting too. Certainly a tradition to keep. 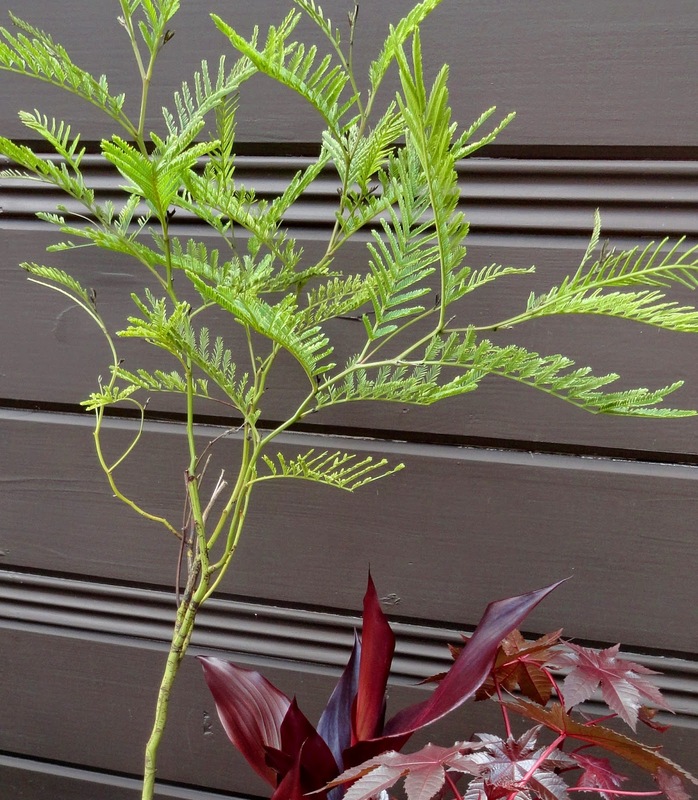 You skipped the wine tasting, but made up for it with the purchase of wine-colored plants. It looks like the property has come a long way since my one visit years ago. Time to catch up. Love your choices! Can't wait to see how you work them in : ) We just got a bunch of different bromeliad from a new friend that needed to divide his. I should blog about it : ) We learned quite a lot that evening. I planted them all yesterday! Yes you should blog about it, bromeliads are wonderful (and easy) plants! That is an incredible place! I can´t believe how many impressing places, gardens, nurseries and houses there are in your area! We truly are blessed here in the PNW. Hi Loree, we're both still exhausted from our 'day out' yesterday but had to take the time to read this nice plant tradition of yours. Looks like you guys had a fun day and nice haul too! I purchased one of those Acanterea odorata from Rare Plant Research at the Master Gardener's Plant Sale in Canby. Since you said you've had one for a year, any tips on keeping it happy? It's such a beauty. It is beautiful, the color is so ghostly. Really I haven't done a thing to keep it happy, yet is still is. It was outside all last summer in bright shade and came inside (under lights in the basement) for the winter. I'd throw some water at it when I remembered. Now it's back outside once again on summer vacation. The plants are fascinating, but so are the buildings! I would have been tempted by a lot of those, too. I'll have to add these destinations to my wish list if I'm ever in the Portland area. Great post! This one is only open to the public once or twice a year, so plan your visit accordingly! Ha! I recognize the two people walking along the lawn (4th from last photo) at the base of the villa, across the pond. That's my wife and I! I love going to RPR's open house. My wife likes it too, but not as much as I do. Wow, good eye! My husband almost came along, he enjoys a visit there every couple of years. 'Impala Red' looks like a good one, and I've heard of them coming back from seed but mine have never gotten big enough to seed around. Maybe this is the year. Yesterday while searching for a place to plant my Acacia dealbata I was kicking myself for buying it! In the end I just did what I normally do and stuck it in somewhere totally inappropriate for the long haul, but where it looks good now! As luck would have it, the exact Dioscorea hemicrypta and Adenia fruticosa in your photos above are now happily acclimating in my greenhouse. I have actually had my eyes on that Adenia for a couple of years. What's the furry leaf you photograph every year. Tibouchina? Cool photo. Hehe. If I had been there I would have been giggling along with Alison. I love that covered atrium. Something like that has been a part of the design for my dream house for years.